Dr Preeti Pandya is an alumnus of the Gujarat University, Ahmedabad. Always a top performer, she was awarded Gold Medal in Plastic Surgery (MCh) by the Gujarat University. She has vast clinical experience in Plastic and Reconstructive Surgery & Burns through her training in an extremely busy department of a government hospital in Ahmedabad and subsequently being an assistant Professor in Plastic Surgery at Government Medical College, Vadodara, Gujarat. She has overseen training of several doctors in her field. She is known to performing all cosmetic surgeries including hair transplant, rhinoplasty, hand surgery, burn scars, body contouring etc. with perfection. She was awarded the most coveted APSI Travelling Fellowship in Aesthetic Surgery and the IAAPS Aesthetic Surgery Fellowship, imparting her unparalleled exposure in cosmetic surgery, working with the stalwarts in the field.Dr. Pandya has invaluable clinical acumen and always strives to remain abreast with the constantly evolving sphere of Cosmetic surgery, ensuring her patients the latest and the best care. 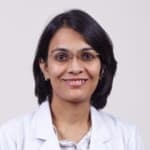 Presently, she is a consultant plastic surgeon at Fortis La Femme, Saket City Hospital, Delhi and Fortis Memorial Research Institute, Gurgaon. Book an appointment online with Dr. Preeti Pandya on Lybrate.com. Lybrate.com has an excellent community of Cosmetic/Plastic Surgeons in India. You will find Cosmetic/Plastic Surgeons with more than 43 years of experience on Lybrate.com. View the profile of medical specialists and their reviews from other patients to make an informed decision. I have very soft skin and I am aged 18. So how can I grow beard within short time? For fast growth of beard apply these very useful methods: • Take 1/2 teaspoon ashwagandha powder and 1/2 teaspoon of amla powder mix it and take it with water once in a day. • Do Sarwangasan daily in the morning. • Do running and jogging daily. • Do neck massage with oil daily. Hi, I am suffering from pitted karate lysis and even legs smell after wearing socks and shoes. Kindly help me out of this problem. How to treat red inflammation on face so many large adult acne is on my face please suggest some measures regarding this? Acne can be associated with Rosacea in which redness occurs on face on exposure to heat sunlight or extremes of emotions. It requires proper guided treatment please consult a dermatologist for this. I'm 23 year old and I'm suffer from hair fall problem for last two month. And it is increasing day by day. I don't know why but earlier I have no problem with hair fall and last two month my hair fall goes on high level. please help me. It is common to have hair fall in this weather. Up-to 50 hairs falling in a day sometimes 100. Can be normal. Don't worry check for any other symptoms in body. Nutrition deficiency, any fever, stress, crash diets, quick weight loss, any hair treatment done like straight ning or pressing, reaction of any medicine taken, thyroid problems, excess of smoking, any drug abuse, infection in body, etc. If anything correct. Otherwise please visit a dermatologist for better advice. I am getting red spots on my stomach and chest even one or two on my arms what r they and how to get rid of them. Take Sulphur 0/4 one dose and then Cosmos 30 3 pills 3 times a day for a month. Let me know the results. What is hair fall treatment naturally by using ayurvedic product and oil free and dandruff free. Ayurvedic medicenes r. 1. Mahabhringaraj taila for external application daily. 2. Badyanaths tea tree oil for dandruff. Hair wash once in 2 days. Hi sir/mam I'm having a problem of dark circles around my eyes. I'm having a proper sleep of 7-8 hours a day. Apart from that I have also applied a cream to remove it but they remain intact. Ive also done a lot of remedies to tackle it but none of them worked. Suggest me something to get rid of it completely, As I've a fair complexion and it doesn't suits me at all. Hello lybrate-user you can apply grated potatoes add some glycerine to it, apply it as pack keep it for 25 min than wash, with lukewarm water, eat pomegranate, take vitamin E. All this will help you a lot. U can ask for further assistance. Hi, I am a 24 year old girl. I have pimple marks on t-zone of my face. I am also suffering from hairfall. Kindly help me getting rid of these problems. Homoeopathic medicine FOLLICLEAN ( WELLMAN) it contain 2 bottles...INTERNAL and EXTERNAL INTERNAL FOLLICLEAN DROPS.....drink 15 drops in 20 ml fresh water 3 times daily EXTERNAL FOLLICLEAN DROPS....Apply 15-20 drops in any oil preferably HAIR GROWTH OIL ( WILMAR SCHWABE INDIA) on roots of hairs with your fingers.No brisssssk massaging required.Leave overnight nd wash next day with MONTANA SHAMPOO ( SBL) Egg white works well in order to lighten the pimple marks and the pimple scars. Take a fresh egg and break the egg, separate the egg white from the egg yolk. Apply this egg white on the pimple marks. After 10-15 minutes, wash with the cold water. Baking Soda Take some baking soda. Mix some water with the baking soda and apply this mixture on the pimple marks. Baking soda serves as an agent that carries out micro dermabrasion on the skin and helps to clear the pimple marks on the face and body. Tomatoes Tomatoes are rich in Vitamin A, which helps nourish the dead skin while rejuvenating it. Vitamin A helps by healing the skin and by helping facilitate quick growth of the skin while removing the scars. Using tomatoes to help heal the scars on the skin is not a lengthy process, but it is rather simple. Just take a tomato, slice it and make it into a pulp. Apply the pulp on the face and leave it on for twenty minutes’ time. Then, wash it off with some warm water. You could also mix cucumbers with it. Make a paste out of all of cucumbers and tomatoes and apply as a face mask. Leave it on for half an hour and wash it with some cool water. Follow this method two days at a time every week and observe the results. Is Hair plantations a solutions of baldness or not, which is most trusted Clinic for it, are there any side effects of it, advice me please. Hair transplant is the only solution for baldness and has no side effects and can be done at fortis hospital. I am an engineering student. My age is just 18 years. I travel 120 kilometers every day due this I am suffering with stress and moreover on the journey we met with one fertilizer company. So that during the time we arrive the company release dust particles into air. Because of all these factor I am suffering with hair falling. So please give me a suggestion to over come this problem. Hello, i'm a homoeopathy doctor, you should juice green more and smoothies. Regular exercise - 20 minute morning or 40 minute evening, after drinking a fresh fruit and vegetable juice. For allergies and hair you can get detailed consultation.